The DCMA01-HI series of DC/DC converters offers 1 watt of output power in a compact 0.77” x 0.40” x 0.28” industrial standard SIP-7 package. This series consists of single and dual output models with wide input voltage ranges and high efficiency. Each model in this series qualifies for IGBT and high isolation applications, has short circuit protection, and has UL/cUL/IEC/EN 60950-1 safety approvals. This series is RoHS & REACH compliant. Notes: 1. These power converters require a minimum output loading to maintain specified regulation, operation under no-load conditions will not damage these modules; however they may not meet all specifications listed. 3. 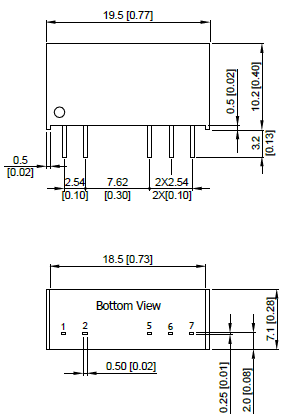 Other inputs and outputs may be available, please contact factory.